Arrhythmia Template Focus function (or DEMIX): superimposition is done for each template in 12 leads and the different ECG shapes can be easily discriminated and edited. Operator can re-arrange the template category quickly. Ventricular escape beat analysis function: histogram is made according to the ectopic coupling intervals. Operator can re-arrange the template category quickly. Atrial prematurity histogram: all the atrial premature beats are classified by their premature rate. Different atrial groups can be differentiated easily. Heart Rate Turbulence (HRT) function (or VE Chaos) : HRT is the most powerful ECG-related risk predictor for assessing the death risk following myocardial infarction. The predictive value is comparable with that of the LVEF. 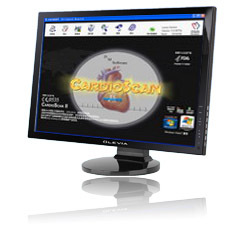 Can analyze Holter ECG recordings from both 3 –channel recorders and 12-lead recorders. Unique “OSAS” (Obstructive Sleep Apnea Syndrome) analysis function. Other powerful functions are: patient event button auto-correlation, QT dispersion analysis, HRV (Heart Rate Variability) analysis (time domain, frequency domain and Lorenz poincare plot), branch bundle block analysis, atrial-fibrillation and atrial-flutter analysis, FCG CADgram (only for 12-lead recorders. ), if 3-channel Holter recorders are used in orthogonal hookup, SAECG (Signal Averaged ECG) and VCG (Vector-cardiograph) can be made.